A couple of weeks ago I came across Sam's etsy shop, Bobaloo. I just loved all of her beautifully handmade children's items. She makes SO many wonderful things that would make glorious gifts for those little people in your life. I mean, really did you see that ah-dorable bunny?? And what about this to.die.for. matching doll and little miss apron, which can even be personalized. So cute. Imagine how thrilled I was when she offered to do a giveaway for Just Another Day in Paradise readers. Are you imagining me jumping up and down? 'Cause that was what I was doing. Sam is so great because she is offering either a boy gift OR a girl gift. The winner will get to choose. 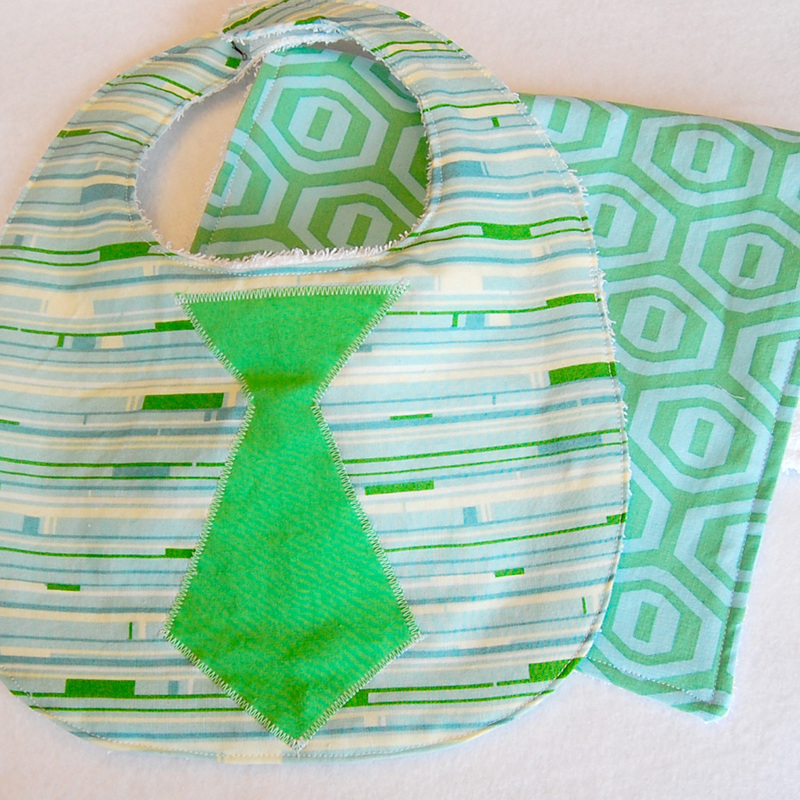 The boy gift is this super sweet bib and burp cloth. I might heart that sweet applique tie. The colors are so mod and cool. The girl gift is this oh so pretty crayon apron. So perfect for your frilly budding artist. Are you excited? I thought so. 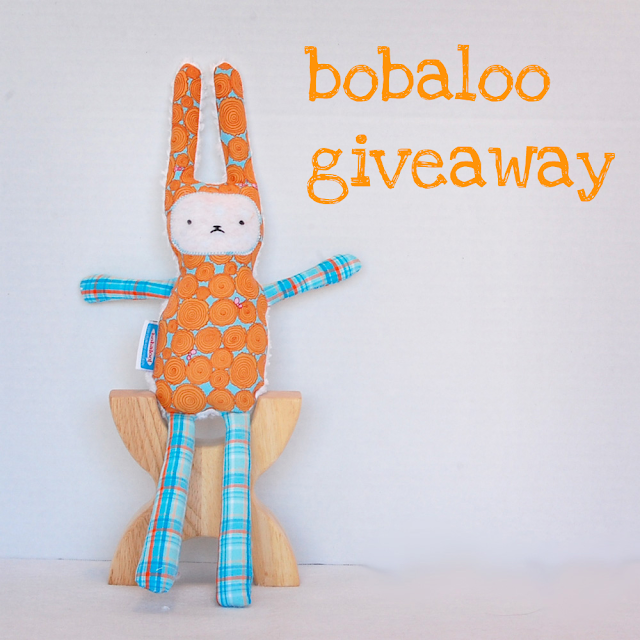 1. mandatory entry- Go to Bobaloo and browse around, tell me your favorite thing in her shop. 2. Become a follower of Just Another Day in Paradise, let me know if you already follow. 3. Just because I am tired of the cold, tell me why you can't wait for Spring. Giveaway goes until Friday, March 4th at 11:59 pm est. Good Luck! Thank you Sam. Seriously go visit her etsy shop. She also has a blog all about starting a homemade business. PS. Thanks for all the birthday wishes AND the love of my retro bowling shirt. I heart all of you guys! My girls would love the crayon aprons. I would like spring to be sprung and the beautiful flowers to fill the yards. No season is prettier or more vibrant! I look forward to spring because it means trips to the zoo and gardens. The tool belt is super cute! Spring means the kids get to enjoy the outdoors and not be cooped inside! 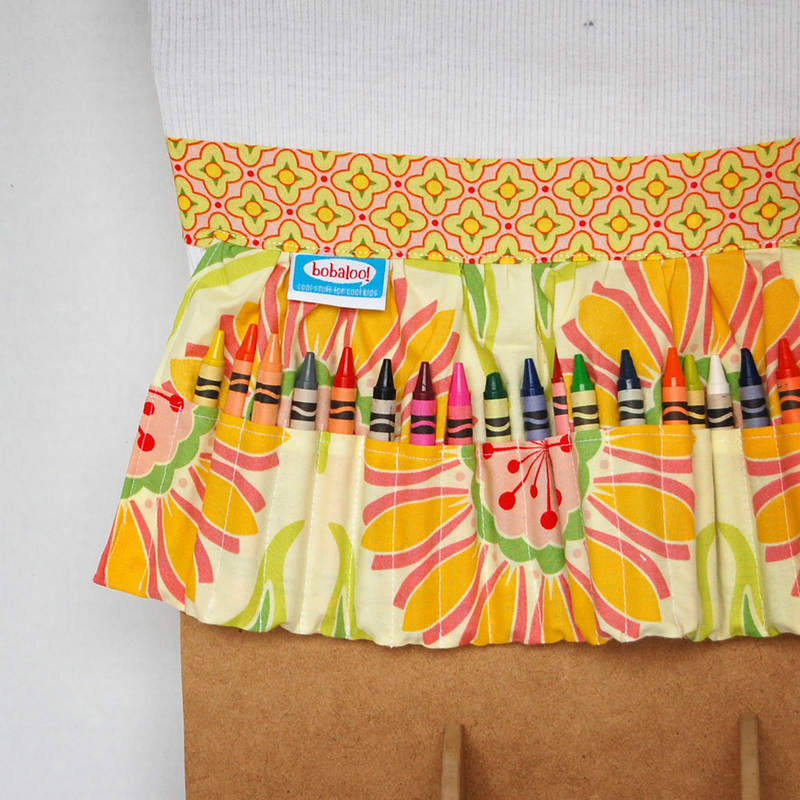 I checked out Bobaloo shop and her crayon aprons are amazing! What a great idea for the little artist! Um...Deelightful, thanks for catching my typo...oops, hehehe. Yes the contest goes until March 4th...I have now fixed the prob. and i am already a follower of yours! and i can't tell you how badly i want the SUN TO SHINE!!! my tulips already think it's spring...they are halfway out of the ground already! love the changing pad clutch & the matching aprons! i follow & love it! My budding artist would love a crayon apron. Might be handy in church! I LOVE the crayon aprons! I think that is such a genius idea! I also love her little baby booties. I can't wait for spring because living in the NW means rain almost non-stop for 4-5 months. I'm dying for some sunshine! My kids are going stir crazy being stuck in the house. My poor little boy gets soaked every day walking to and from school. Plus, I'm going to Hawaii in the spring so I would really REALLY like it to hurry up and get here! LOVE this giveaway!!! I adore the kids toolbelt in roundabout, adorable. Thanks for the giveaway! Well I pretty much have only two seasons here: dry and wet, so I am not really looking forward to spring because it means the rain will be coming soon! I guess on the flip side I could say I am looking forward to the last of the rainfree afternoons!! I miss the flowers - I can't wait for spring! I love the hair clip organizer! I think the Little Blankie in Pink, Brown Satin Dots with Super Soft Cream Velboa is really cute! I can't wait for spring because I NEED some sunshine and fresh air! I'm following you! We have had such a hard winter here in the northeast. I am yearning for daffodils, tulips, and green! I love Bobaloo's store, and have ordered from her before. My daughter just had a little girl a month ago. Thanks for the giveaway! I love the rabbit. Whoops, I didn't realize I had to leave three separate comments. Well...my favorite thing in the shop right now is the bunny, but also love the burp cloths! Such great fabric! OK -- third comment...I love your blog, too! Just discovered it today! Adorable shop! I love all of her boy bibs. I can't wait for spring because I get to meet my baby in June (which is really the start of spring for us, sadly)! I seriously love everything but I love her boys toolbelt. I can't wait for spring so I can get my boys outside and let them run, run, run! I'm a follower of your blog.....love all the things you do!!! I'm looking forward to spring because my parents are taking my husband, myself and 5 kids to DISNEY...... my 3 year old is going to have a heart attack..... May needs to come...I'm sick of the snow. I especially love the necktie bib in blue and green. I love the barrette organizer! I can't wait for spring because it means we can go out again--to the park, to the zoo, or even just the backyard. my husband comes home from deployment!! Those little baby shoes are WAY to cute! It is hard to find something for a babies foot that doesn't have a hard sole. Must have! 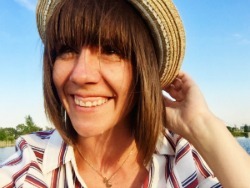 I have been following your blog for awhile, but just became a follower! I CAN NOT wait for spring because that means summer is right around the corner, and my kids and I need to get out of the house and run in the green grass! White snow is pretty in dec. therefore I am over snow! Bring on spring! 1. 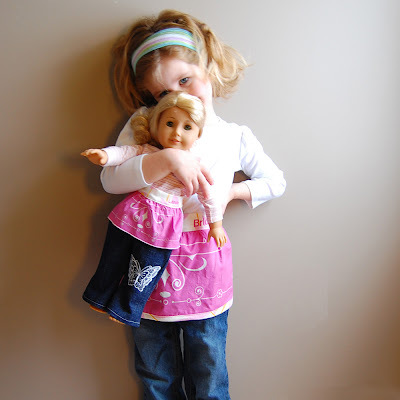 Love the kiddo and doll aprons! 3. Can't wait for Spring...new outfits for Church/Easter, Spring Flowers, SUN! I like the Barrette Organizer. I can't wait for spring because I am tired of jeans and long sleeve shirts! i love the barette organizer!!!! i am looking forward to spring this year especially because my son is turning 1!!!! I am so ready for spring, it's cold here again in Georgia and I am so ready for the sunshine to come and stay! !